Botswana Predator Conservation Trust, Tico McNutt and Botswana Wild Dog Research Project - Save the African Wild Dog - make a donation. Through the long-term commitment of Seattle-native Dr. John "Tico" McNutt, the lingering walls of misunderstanding concerning the African wild dog are being toppled to protect the last vestiges of the species in Botswana's Okavango Delta. "We continue to fundraise as part of our ongoing activities and although far from target, we carry on. We are grateful to our dedicated donors, old and new, for their valued support." Left: Breeding pair of African Wild Dogs Middle: Dogs have to stay alert - as well as poisoning and trapping, they are also vulnerable to Lion and Hyena attacks. Right: Radio tracking of dogs through beacon collars to asses distances travelled and migratory patterns. UK tax payer? Your donation can help give an extra boost through a Gift Aid Declaration. The Botswana Predator Conservation Trust promotes the conservation of wild dogs in conflict with human communities. Using applied research - such as utilizing scent to deter dogs from attacking domestic livestock - and public education, McNutt is committed to providing a long-term study and monitoring of wild dog populations to create strategies to combat the carnivore/human conflict. "Success in any conservation effort anywhere in the world, whether directed at an endangered species or tropical forest, will depend on the social and economic security of the people who live directly in its shadow." 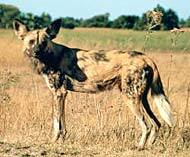 The Botswana Wild Dog Research Project began in 1989 with support from the Frankfurt Zoological Society - Help for Threatened Wildlife in response to international recognition of the need for a greater scientific understanding of Lycaon. Because Botswana is home to a large percentage of the world's remaining wild population and because conflict with domestic livestock has been identified as an important problem, the government of Botswana eagerly endorsed the research. The study area is located in the north-east terminus of the Okavango Delta, encompassing the eastern part of the Moremi Game Reserve. The area is approximately 3,000 square kilometres and is home to an estimated 150 to 200 wild dogs. The focus of the field research has been to continuously monitor a sample of free-ranging wild dog packs in this part of northern Botswana. The results of 9 years of research (and that of concurrent studies in Tanzania, Zimbabwe, and South Africa) are an impressive archive of information on the wild dog. Accumulating information about habitat requirements, social and hunting behaviour, dispersal patterns, causes of mortality, reproductive patterns, population genetics, and disease contributes to a valuable cache of knowledge. The research also exposes a fascinating and captivating social predator characterised by an extraordinary co-operative and non-aggressive nature- compelling evidence against the image of wild dogs as merely dangerous and vicious killers. In 1993, the Botswana Wild Dog Research Project began research to assess the prevalent attitudes towards wildlife in northern Botswana and the social factors that affect community conservation and wildlife resource management. The aim is to provide information on the nature of attitudes and behaviours toward wildlife in local communities in an attempt to quantify the overall impact, both social and ecological, of community approaches to wildlife resource management. Ultimately, the research will contribute to a body of knowledge upon which citizens of Botswana can develop and pursue their own realistic development strategies for an increased standard of living and create management objectives that focus on the conservation and sustainable use of their country's rich natural biodiversity. Please visit the Botswana Predator Conservation Trust’s own web site to learn full details about what they do and how you can help.